Posted on March 11, 2015 by No Map Required Posted in Art, Art & Engineering, Chile, Places	. While we have a number of big posts in the works (helloooo Machu Picchu, Uros Islands and Bolivian Salt Flats! ), I thought I’d do a quick post on a jeweler we just met yesterday! 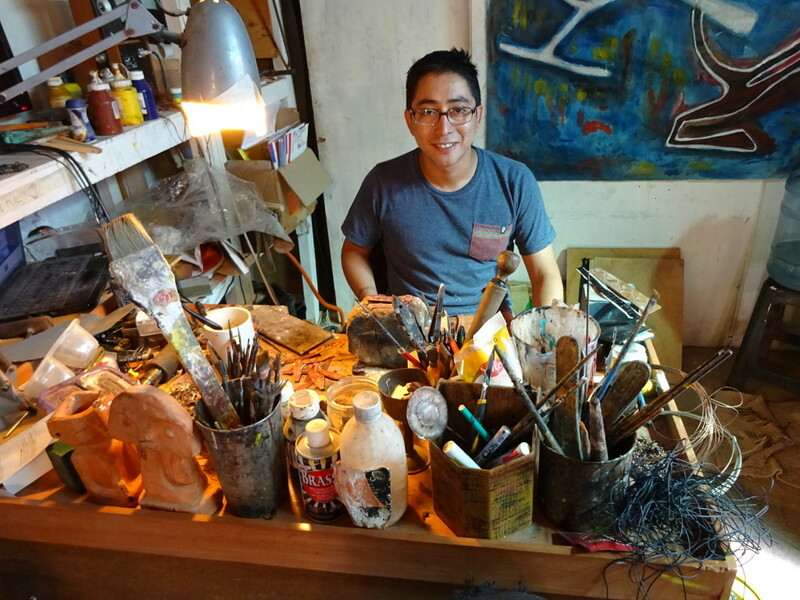 Cristian Antinao has a studio/store space here in San Pedro de Atacama, Chile where he makes jewelry, does some painting and hosts other artists who work and show in the same space. Pretty amazing for someone as young as he is… I may be wrong, but I think he’s only 27! When we asked how long he’d been a jeweler, he paused and then told us about how he’s from a family of artists and started when he was only 15. He’s also an accomplished griffiti artist, sculptor and painter. AND he was friendly as could be!!! 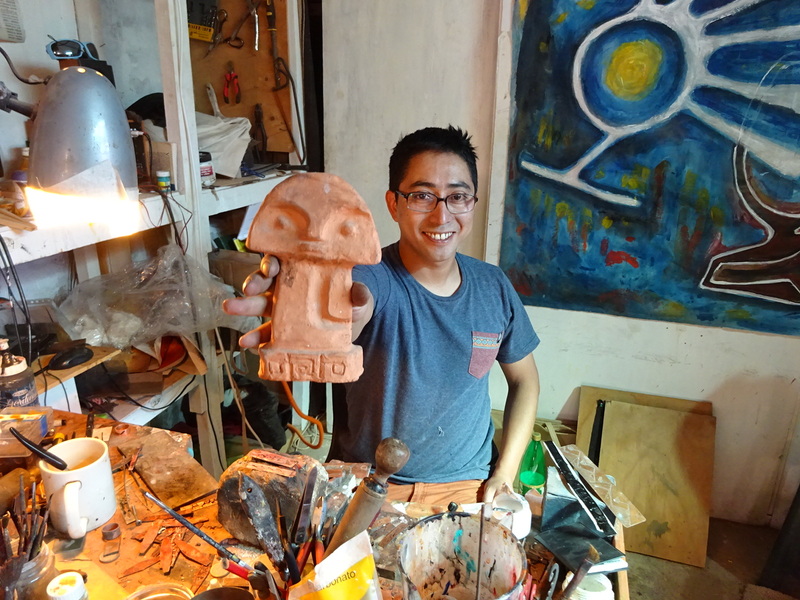 Cristian with one of his small sculptures inspired by the ancient local culture. He does some wood jewelry like me, including carving patterns and inlaying crushed stone. 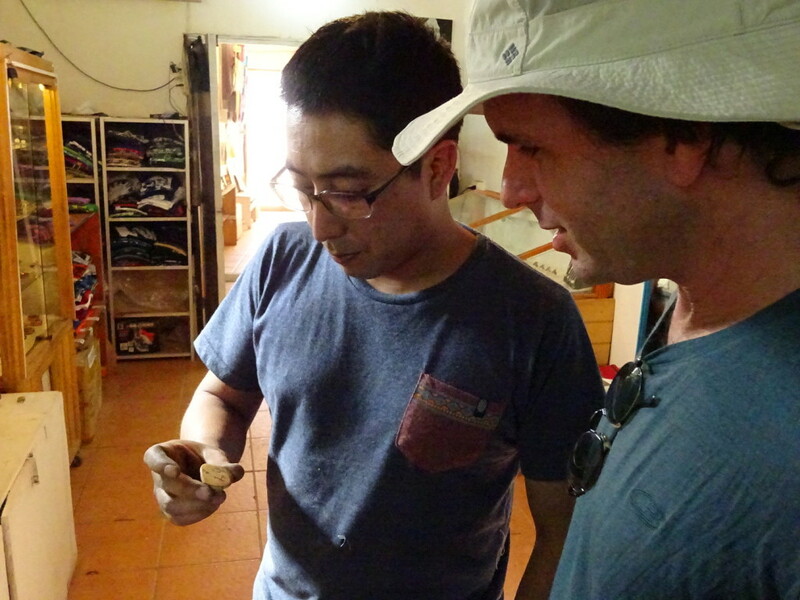 Sorry for not taking more photos, especially of some of his work with dried cactus and bamboo!, but here’s a video we took of him showing me one of his processes. Very cool technique! Going to have to try that one when I get home, I think! If you’re interested in reaching him, he’s at cristian.antinao@gmail.com and Facebook and you can find photos of his work here (mostly paintings). That counter only looks messy to everyone else. Bet he has a system and knows exactly where everything is. You, too, undoubtedly. And when did 27 become “only 27”? Yep, that’s exactly what he said – chaotic but he knew where things were. I’d like to agree for myself, but eventually mine was just chaos where I thought I knew where things were…but didn’t really. Have to be better when I set up again post-trip.